“Nothing short of greatness” – that is the motto of the University of Minnesota’s fundraising campaign to provide its sports programme with the state-of-the-art facilities it requires to dominate US athletics. For that purpose, the university has built the Athletes Village, a labyrinthine behemoth of concrete spanning 320,000sq ft at the university’s campus in Minneapolis. The complex, completed this January, already serves as a hub for the university’s athletes and sports teams. The project cost $166m, a staggering sum even for an institution of the size of the University of Minnesota, with its more than 50,000 students and $3.2bn endowment. To bring it to life, the institution followed the example of other US higher education institutions and issued $425m of AA-rated bonds. Around a fourth of the proceeds will cover costs for the Athletes Village. Higher education is the new frontier for the bond market, as an increasing number of universities issue bonds to finance debt or investment. Data held by Dealogic, a financial data provider, shows that the value of bonds issued by education providers worldwide nearly trebled from $2.2bn in 2007 to $6.4bn in 2017 (see Fig 1). Some of the biggest US universities, including Harvard, Yale, MIT, Stanford and Princeton, feature in the list of top borrowers. In most cases, the money is spent on brick-and-mortar operations, from student residences to football stadiums and libraries: US universities spent a record $11.5bn on construction in the 2015-16 academic year. Many institutions hope to tap into the opportunities that come with globalisation; to lure international students, they invest in flashy dormitories or even campuses based abroad. Laureate Education, a multinational education provider and the top education bond issuer globally (see Fig 2), has campuses and online programmes in 23 countries and plans to expand its operations further. The majority of US universities opt for municipal bonds, a financial vehicle traditionally preferred by US states or cities. The benefits are immense for institutions with an eye on the future rather than short-term profit, said Emily Wadhwani, an analyst at Fitch Ratings, a credit rating agency: “Municipal bonds have a lower cost of capital and wide market reach, as compared to other financing vehicles. They also allow the cost of a project to be spread over its useful life (30-40 years for most large capital projects), and also spread the resultant student fees more fairly over the life of the project. In addition, using long-term fixed-rate bonds removes the risk of increasing costs going forward.” As for investors, they pick municipal bonds for their low risk, a crucial asset in times of increasing volatility in US bond markets. Debt can also be disastrous if a project takes a wrong turn. UC Berkeley offers a cautionary tale of what can go wrong: the Californian university borrowed $445m from the bond market in the aftermath of the financial crisis to rebuild its American football stadium. The plan overestimated the number of supporters the stadium could attract and the quality of football the university’s team could play, falling short $120m. Eventually the institution was forced to plug the financial gap with campus funds, including student fees. Bond issuance has long been a common practice for US institutions but, according to many experts, the decline of public funding has turned it into an inevitable process for universities relying on grants to finance research. Data held by the Centre on Budget and Policy Priorities, a US think-tank, shows that public funding for the academic year 2016-17 was nearly $9bn lower than the figure in 2008, while tuition fees and student debt grew exponentially over the same period. The drop in public funding has pushed universities to cosy up with the financial sector, said Banerji: “In the last couple of decades, we’ve seen a huge expansion in the nature and number of financial transactions between the financial sector and universities – interest rate swaps, letters of credit, bond agreements, hedge fund investments, and more – all of which handsomely benefit the financial sector.” The Roosevelt Institute’s report on university-linked interest rate swaps found that interest rate swaps cost 19 US institutions around $2.7bn. Another reason why bonds have become more popular is the shifting nature of university leadership. More than one out of two members of university boards at research-intensive institutions have a background in finance, according to data from the Stanford Social Innovation Review report. Research by Charles Eaton, Assistant Professor of Sociology at UC Merced, shows that as more people with a financial background sit on university boards, financial solutions that would once seem unconventional to academics have become the norm. 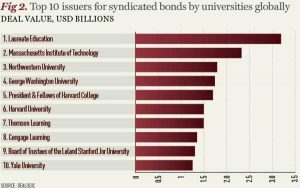 For British universities, bonds have only recently become an option for raising funds, but demand is steadily growing. Dealogic data shows that the bond market for the UK education sector increased tenfold from £272m ($380m) in a single deal in 2007 to £2.4bn ($3.3bn) last year. As in the US, government funding for higher education has dropped by more than 30 percent since the financial crisis, pushing higher education institutions to consider alternative options. For their part, institutional investors opt for university bonds for their higher returns (compared with government debt) and their safety, since the UK higher education sector is highly regulated. Leading universities are deemed credible borrowers with a global brand name – always an asset in bond markets – and can therefore afford to offer long maturities. 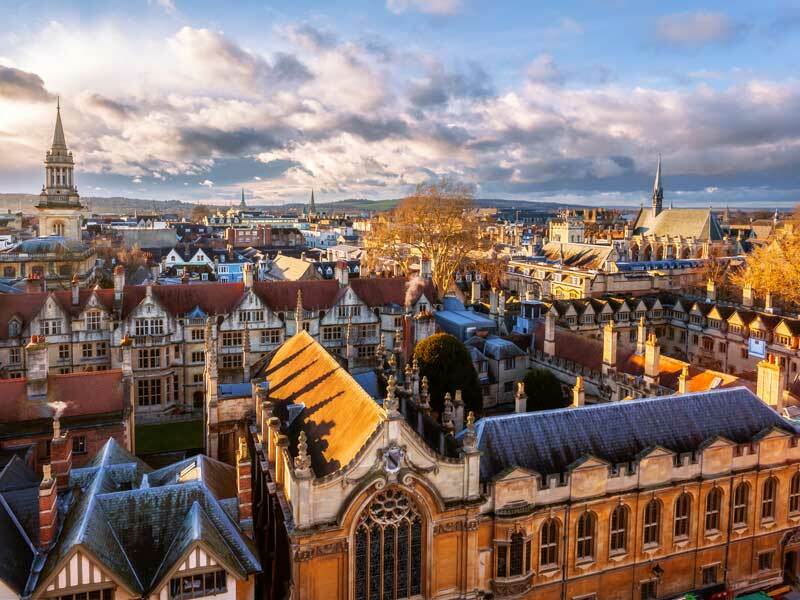 “We see the length of the bond, along with high demand from investors and the 2.54 percent rate achieved, as testament to external confidence in Oxford as an institution and in the high quality of its teaching and research,” said Oxford’s spokesperson. Recent history has shown that caution about bonds is not unfounded. In 1995, Lancaster University issued a bond at a high interest rate. More than a decade later, the credit crunch pushed the university into financial strain because of the conditions attached to the bond. The University of Greenwich issued a bond in 1998, only to withdraw it four years later after its credit rating was downgraded. Australian universities are becoming competitive internationally, poaching Asian students from US and UK competitors. To accommodate them, they have to invest in infrastructure, but traditional financial channels are less accessible. Last year, the Australian Government decided to wind up its Education Investment Fund, the public body funding teaching and research, forcing universities to consider alternative financing options, such as public debt. Bond issuance has increased from just $41m in 2008 to more than $1bn in 2016, according to data by Dealogic.